Two Kentucky women are giving baby dolls to people with Alzheimer's and dementia, helping them feel comforted and loved. Sandy Cambron and Shannon Gray Blair visit senior living facilities around the state and bring with them Pearl's Memory Babies. Cambron and Blair are co-workers who dedicate their free time to Pearl's Memory Babies, an organization named after Cambron's mother-in-law. Cambron came up with the idea 12 years ago when her mother-in-law died from Alzheimer's. "My husband and I knew how much the baby doll we had given her meant to her," she said. "So, at Christmas, instead of giving each other gifts, we bought baby dolls for different nursing homes and took them at Christmas time to the Alzheimer's patients, as our gift to each other." The couple did this for several years, and then Blair joined the team. Blair's own mother was diagnosed with Alzheimer's and Cambron offered to give her a baby doll. "I didn't understand why Sandy wanted to give mom a baby doll," Blair said. Still, she decided to take Cambron up on her offer and brought a baby doll to her mom's nursing home. "When I walked into the room with the baby doll, my mom's roommate just held out her hands and started crying and was way more emotional and way more involved," Blair said. "And when I came back to work I told Sandy, 'Now I know why you do this.'" The co-workers decided to bring more baby dolls to the nursing home – one for every Alzheimer's patient there. From there, the nonprofit organization was born. Pearl's Memory Babies is funded entirely by donations. The pair uses a GoFundMe page and accepts donations on their website and Facebook. "All the donations we receive we just put towards the next delivery," Blair said. The nursing home residents often feel an instant connection with the baby doll and feel comforted by the loving bundle of joy, the pair said. They also bring stuffed dogs for people who miss taking care of pets. 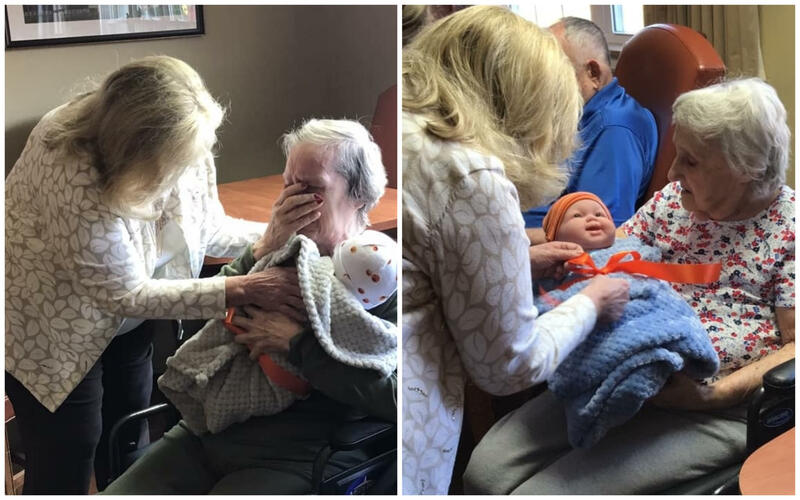 Touching videos from their recent visit to Green Valley Care Center in Louisville show residents lighting up when they are handed a baby or dog. May instantly start rocking the baby to sleep or petting the pup – natural instincts of care. Their delivery to Green Valley Care Center was their biggest yet – 45 baby dolls and 22 stuffed puppies were brought to residents there in October. Cambron and Blair are planning their next big delivery around Christmas time. They know it's important to help others, so they dedicate their free time to visiting senior living facilities. Babies and puppies can add cuteness to anybody's life, but Pearl's Memory Babies are extra special, and the comfort and love they provide is priceless.